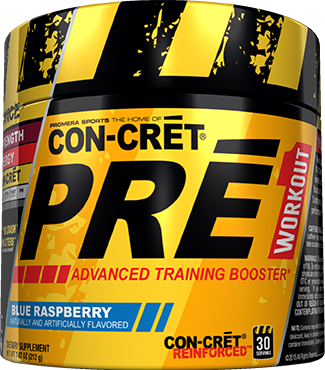 Directions For CON-CRET Pre Workout: Adults, mix 1 serving (1 scoop) in 6-8 ounces of water 15 minutes prior to working out. Once tolerance is assessed, you may increase use up to 2 servings (2 scoops). Do not exceed more than 3 servings (3 scoops) in a 24 hour period. Do not consume 6 hours prior to bedtime. NOTE: Each serving contains 200mg of caffeine. Warnings: This product is not intended for individuals under the age of 18. Do not use if you are sensitive to caffeine. Always consult your physician prior to using this or any other supplement if taking any OTC or prescription medications. Do not exceed the recommended serving. If you experience any adverse reaction discontinue use immediately and consult your physician. Store in a cool dry place. KEEP OUT OF REACH OF CHILDREN. DO NOT TAKE IF YOU ARE PREGNANT, CONTEMPLATING PREGNANCY OR NURSING.